If you’re like me, trying to squeeze in time to ride in the evening while still getting a warm meal on the table is a difficult balance. Most nights I barely have enough time to heat up leftovers, let alone prepare a nutritious meal from scratch. Add two (rather picky) kids to the mix and dinner time becomes stress time! Lucky for me I’ve found a great cookbook that offers an easy solution. 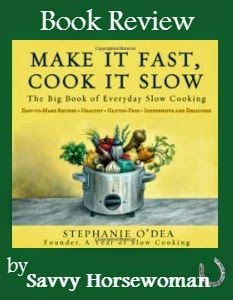 The title pretty much says it all: Make It Fast, Cook It Slow: The Big Book of Everyday Slow Cooking . I had gone through a few slow cooker phases before but quickly got bored of the same old stew and casserole recipes. Plus doing lots of extra prep work in the morning is not an option! This book opened up a whole new world of possibilities for me and my slow cooker. Everything from breakfast to dessert is covered here, and the “Fake-Outs” section has some great takes on many of our regular restaurant favorites.
) but I do tend to agree with some of the negative comments. If you’re looking for a really refined, gourmet cookbook, this is probably not for you. 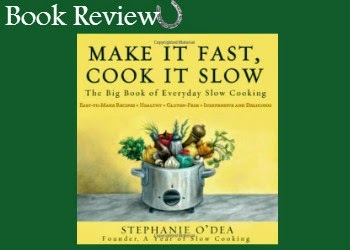 However if you want to make quick, and easily modified meals with ingredients you probably already have then I highly recommend Make It Fast, Cook It Slow: The Big Book of Everyday Slow Cooking . Here’s to more time at the barn!